CARSON, Calif. /California Newswire/ — Wham-O, the iconic all-American recreational brand synonymous with fun and sport, announced a strategic partnership with Smacircle LMT Ltd to introduce better solutions in “LAST MILE” transportation. This partnership brings a company with 70 years of cultural significance together with the creativity and innovation of the Smacircle startup. Leveraging the research and development of Smacircle and sales and marketing expertise of Wham-O, the two companies will work to help customers solve the commuting problem with awesome technology. Wham-O and Smacircle will introduce Smacircle S1, the world’s most compact and lightweight eBike. Weighing approximately 17 pounds, the S1 can easily be folded in five simple steps into a small backpack. Because of its outstanding design, the S1 was named an Honoree for a CES 2018 Innovation Award in the Tech For A Better World product category. 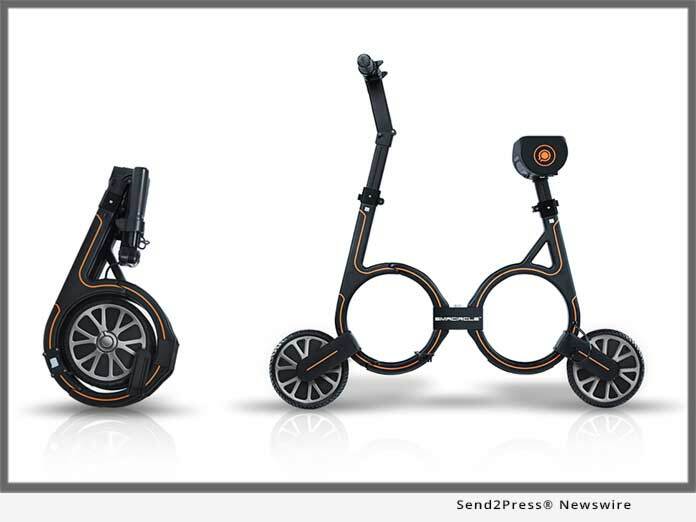 The Smacircle S1 is the lightest and smallest eBike in the world with a folded footprint of 19 inches across. While it may appear frail, the body is mostly constructed of carbon fiber capable of supporting up to 220 pounds, making the S1 perfect for work and travel. “We believe in innovation and simplicity. And we also believe that products should either make our lives easier or make them more fun,” said Olyvia Pronin, director of marketing of Wham-O, USA. The high-quality, high-capacity Samsung battery for the Smacircle holds up to 1-15 miles on a single charge, and the battery fully recharges in three hours. The 5,700 mAh battery pack and 240W motor are powerful enough to propel the S1 to a top speed of 15 mph and a grade of up to 15 degrees. The Smacircle S1 comes with an iOS/Android-compatible mobile app that lets the user lock and unlock the bike; adjust the lights; and track routes, maximum speed and trip duration. The Smacircle S1 will launch in February and retail for $1,399 USD. This version of news story was published on and is Copr. © 2019 California Newswire® (CaliforniaNewswire.com) – part of the Neotrope® News Network, USA – all rights reserved. Information is believed accurate but is not guaranteed. For questions about the above news, contact the company/org/person noted in the text and NOT this website. © 2019 Mass Media Content. All Rights Reserved.